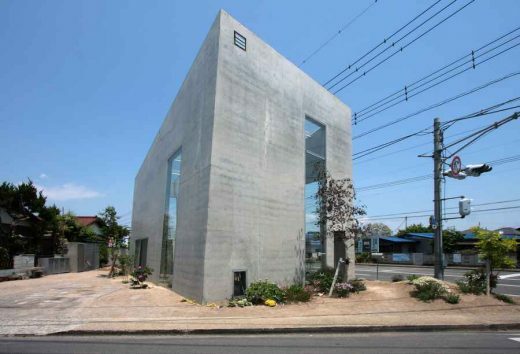 This residential building in Gunma was born to be able to hold it to prevent rain and wind. 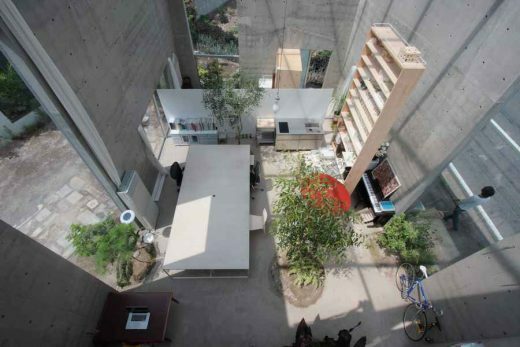 This building is made only on four pieces of walls and roofs. The primitive constitution showed the possibility “that a person seemed to be able to spend somehow”. In fact, it rises in joy and presence of mind and discovery here. As for the design method, simplicity is clear. Make a box to live, establish the window to be connected to the town, grind a ceiling transparently to look up at the sky, plant a tree to make a bower, make a floor soil so that a root grows, raise a ceiling to be brought up greatly. So there are the scene that is various inside and out, and come across the scene beyond the imagination. This is comfort of the kinds unlike a feeling of outdoor openness. There is comfort to lead to the outside from the place that was followed physically psychologically, or enjoying wind and rain not to prevent them. There is our environment that continues changing dynamically around all over the world. There are a season and time and weather coming out of movement of the earth. There is society if in the city. In nature, we are surrounded by a forest and the sea and creatures. They are complicated and are beautiful and are fleetingly are strictly. I want to make the building which I can be impressed by for an instant in an instant entrusting the position to the big environmental flow, and enjoy a slight difference. This atelier is in the environment where an evening of the summer has many thunderstorms, winter has fine weather and strong, dry wind blow in. On winter, the Sunshine pours into the ground. In the night, the shadowgraph moves on the wall. To grow the tree, I water it. If time passes, here is becomes a grave. General Contractors: Kenchikusha Shiki Inc.